After a hiatus that was threatening to turn epochal, the Thirsty Boys finally managed to be in the same place at the same time and in the company of a themed beer selection. It’s certainly not that we hadn’t been drinking in the meantime, it’s just that orderly structure had eventually given way to a pleasant casual whimsy. However much like a room of monkeys on typewriters, all we had to do was wait long enough and this day was bound to happen. Being nothing if not contrary, it was decided to ignore the fresh sensorial delights of the current wet hop season and instead explore the dusty old box that had been unearthed when I recently moved house. I knew there had been some bottles somewhere in the garage, some of which had been put away on purpose, others less so. I hoped some might be nice, but figured that even if not, then it could provoke interesting discussion about the whys and wherefores of ageing beers. The box turned out to contain a pleasingly wide variety of beer styles. First up being a 2012 Saison from Orange County’s Belgianesque The Bruery. They no longer make this under the same label, but spinoff brand Bruery Terreux do. It’s made with rye and bottle conditioned with some brettanomyces. Described in the literature as rich and hoppy when fresh, but expected to “…dry out and become more complex with rustic notes of leather and earth” with age. On the day it was delightfully classy start to proceedings, with the advertised earth and leather propped up against a fruitiness which opened up and became more complex a little while after decanting. This very vintage won Best beer of 2012 by Wine Enthusiast magazine. We gave it 7/10 Man Points (see here for no real explanation at all), though we scored all beers at the end of the tasting which leads to something akin to curved grading. Conversation then turned tangentially to how hipsters were now drinking the iconic Scottish budget fighting juice Buckfast, the origin of the hipster culture, and merits of artisanal firewood. Batch barrel aged in central Otago Pinot Noir barrels for 3 months, then left to its own devices in Greasy’s garage for 3 years. Invercargill say it “….will only improve with age”. Despite an erratic supply this far North (unlike a few years ago when we could get our hands on an extended range) Invercargill brewery are still warmly regarded by several of the Thirsties. Would age legitimise that fondness or highlight the erraticism? Well with minimal carbonation it poured an enticing deep walnut tinge and…. This sultana-containing Quadrupel was the originator of the stash for ageing. It was picked up at Wellington’s Beervana festival in 2011 or 2012; memory failing me slightly. However I do remember the distinct feeling that it was a) amazing, and b) could be even more so. Hence putting it away and trying harder not to drink it than I normally try not to drink things. The bottle blurb states it would continue to develop for 3-4 years. It was agreed that we’d like to have another one, which was a problem since sadly it appears to be discontinued by 8 Wired. This is an inherent risk in ageing beers, in small volume anyway. When you get it right, and find yourself relaxing in the glow of a decadent complex beer at its peak, the feeling risks being tinged with the regret of not buying and keeping more at the time. You may have notice that the proceedings have gone Belgian – stout – Belgian – stout, turns out it’s not easy to order this selection. I went with anticipated size and body rather than beer type (then stuck the freak at the end…). Other suggestions would be welcomed though! Anyway: back to Liberty. Described as a “Black Forest Stout” this single batch from 2012 contains a hefty dose of sour morello cherries. It was made for Brewers Guild New Zealand awards, and won a medal. However it really has its roots in a much more personal symbolism. It commemorates Liberty Brewing’s Joe and Chistina Wood’s 12 years of marriage. Apparently they were aiming for 12% ABV, but missed. I hope that fact isn’t symbolic of anything. Muriwai was a special place in their youth and the beautiful label was by an art teacher from the college they met at. It really was a bottle with sophisticated elegance. I remembered thinking it as a good end-of-night beer originally, but our commentary suggests that the effects of time may have shifted its optimum place in one’s daily routine. Compared with the rest of the night’s dancecard it didn’t have as much depth or complexity of flavour. But we did wonder what it would be like with even more age. Since it was my last bottle, the regret firmly took hold. This American dark barley wine is the oldest of the bunch. Crafted in 2010 as one of four commemorative and collaborative brews to celebrate Sierra Nevada’s 30th anniversary. This one was a collaboration with Jack McAuliffe of New Albion Brewing who has been described as the first American microbrewer. 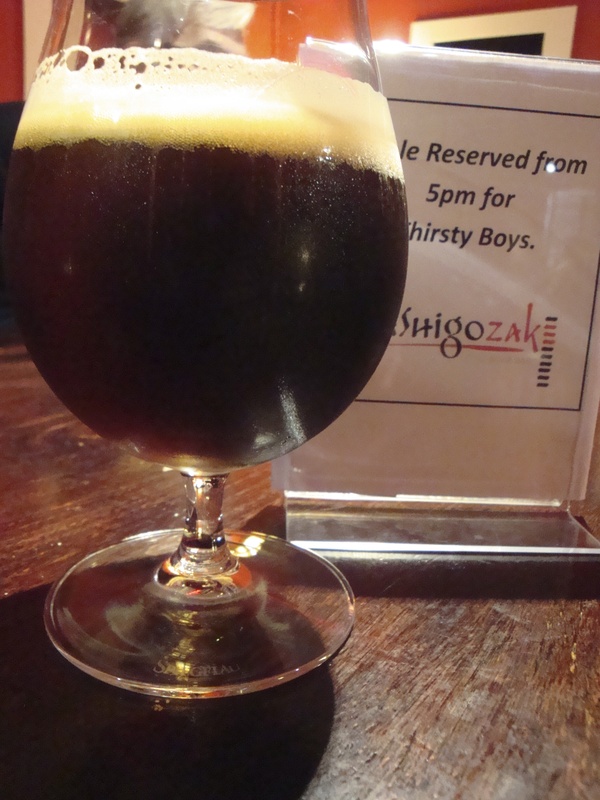 It is said that… “this robust ale should age gracefully for years”. Today we could prove it. Not much could be researched about this oak aged sour from 2013. Brouwerij De Molen themselves had no mention of it on their website. There’s a discussion on Ratebeer.com about how the bottle was made differently to the draught. Google translates the name as possibly meaning council and deed. Mysterious. Very different style to the other beers, as apparent in the atmosphere created by the swirling glasses. Well what could we conclude from the evening? Apart from wishing I’d saved the Sierra Nevada for last. Exploring the effects of ageing would be much more successfully achieved if we had tried aged beers alongside their more youthful versions. Some American brewers are now branding some of their range as “vertical beers” for this express purpose. Unfortunately some of our brews were batches never again repeated, denying us that opportunity. But we can safely say that this selection was aged and it was delicious. Relying on our memories somewhat, they were generally felt to be more complex and interesting than they had been originally. I’ve decided imperial stouts and barley wines are the ones to put aside for me, so I’m off to find some more to fill that new hole in the garage. 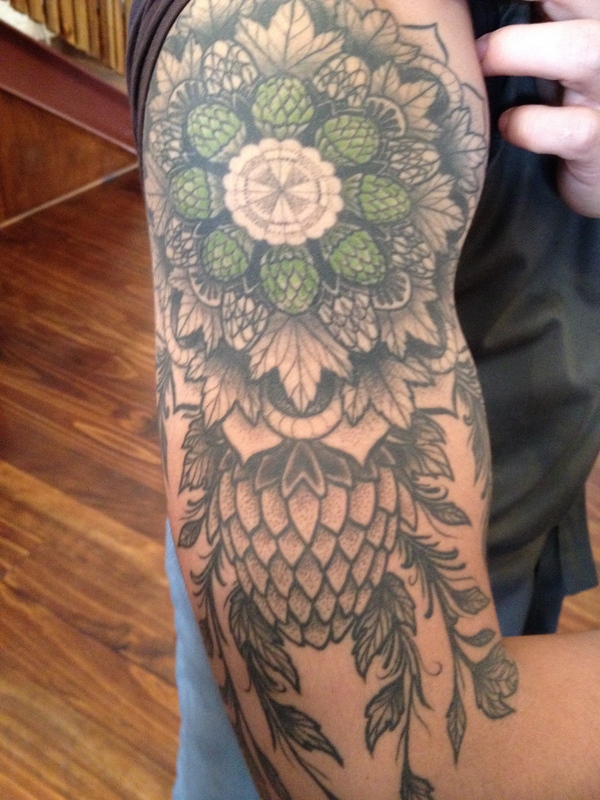 Recently, a few of the Thirsties had a chance to get a close up look at this tattoo on local brewer Shiggy of Funk Estate. A great composition and low-key use of colour and shade – it’s all about the hops. 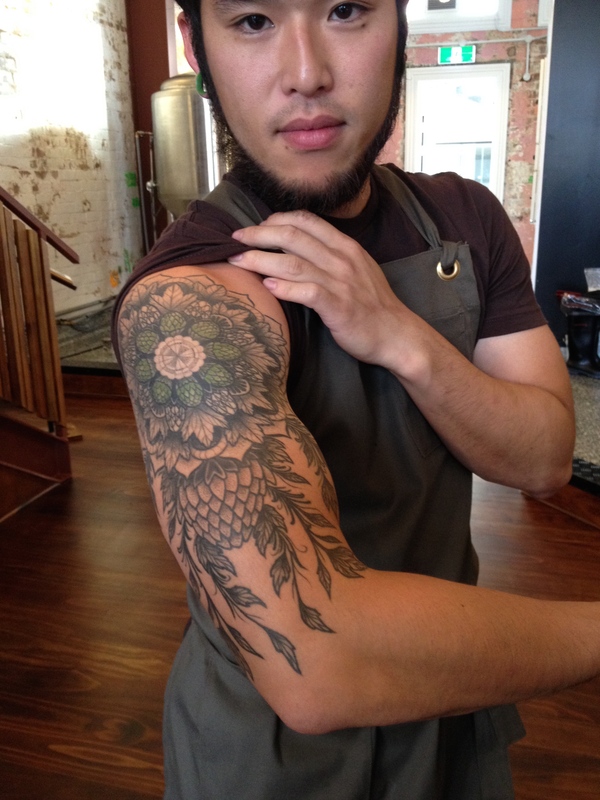 Tattooing by Tim Gau of Renegade Tattoo, Wellington, New Zealand. Like some of the Thirsty Boys, our reader(s) may have found a hobby of beer appreciation and mediocre poetry can conflict with an attempt to lead a vaguely healthy lifestyle. It’s not that it has to be an inherent problem for a drinker of moderation to fight the battle between a bulging waist line and those oh-so-beautiful little beery calories; it’s just that in a busy modern lifestyle the time to add some yin to that yan can be hard to find. Luckily there’s a whole bunch of diets out there that could be applied instead. You know, if you actually wanted to. Well now we’ve got one that allows you to have “two martinis or bourbon, scotch or rye before lunch, and thick steak generously spread with Sauce Bearnaise“…. so stick that in your Paleo/Atkins/HCG/etc pipe and smoke it, where do I sign? Although the diet’s popularity was short lived due to famous nutritionalist Frederick Stare calling it “mass murder”, it’s author Robert Cameron made a fortune & lived into his nineties. So there. 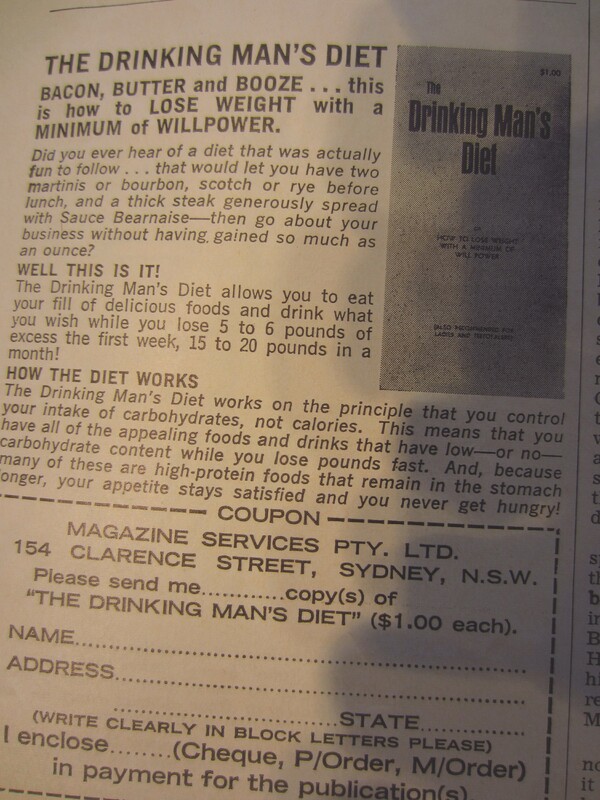 Sadly despite the fact I’d happily pay $1.00 to find out the details, we may be too late for that particular deal as this ad was seen in a 1960’s vintage copy of Man Magazine…… It is however available on Amazon for just $3.30, inflation be damned. Well groomed Wellington gents who frequent Lance & Michael at Courtenay Barbers may have stumbled across their copies of Man recently. This wee gem of political incorrectness from a bygone age is a Mad Men-esque publication featuring articles on manly hobbies such as golf and embracing alcoholism; short fiction in which the female characters are pretty much just punctuation; and tips like how to adapt your wife’s favorite recipes into something you could seduce your lover with. Of course there are a few photo shoots of naked young ladies too, just in case the reader never got to find out what they actually looked like. More about Man magazine here, it really is a hilarious read. 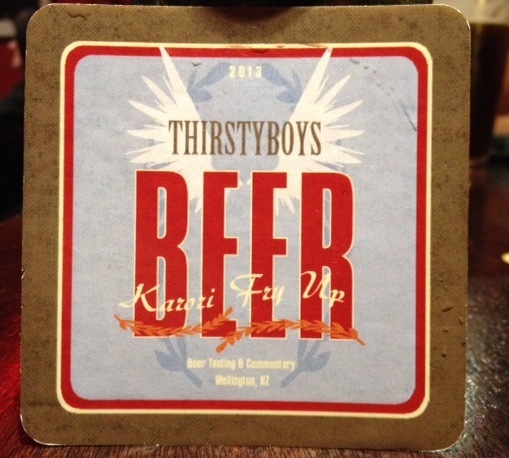 This personalised coaster turned up under one of the Thirstyboys (karori fry up) Christmas trees a few months ago. Nice job…unidentified designer-person, nice job. David Tua inspired a craft beer? Today, if you say “o for awesome” in New Zealand, there’s a good chance people know the moment you are referring to. Fast forward to February 2012, and the moment inspires the collaborative brewing of an Imperial Amber Ale by brewers 8 Wired, Renaissance and Nøgne Ø.
It’s O – Ø for Awesome! It was pretty awesome….firstly, because it comes in at 9% (so you won’t be drinking it by the six pack at the Apia Way Niteclub); secondly, it tastes rich and toffee/chocolately (so you won’t be knockin’ it back); and thirdly, because according to Miller, it has “one of the longest beer names in recent New Zealand history: “8 Wired/Renaissance/Nøgne Ø – Ø for awesome (9% 75 IBU)”.” It was also awesome to be sipping it with the Thirsties. The proprietor of the bar said he hadn’t had it in since the end of 2012. So…choohooo! There is no argument that Tua is awesome….and I think it’s awesome that his modest contribution to the “popular lexicon” is celebrated in New Zealand beer geekdom in this memorable way …but you’ve got to read Neil Miller’s original blog to get an expanded telling of this beer story. Check it out here.